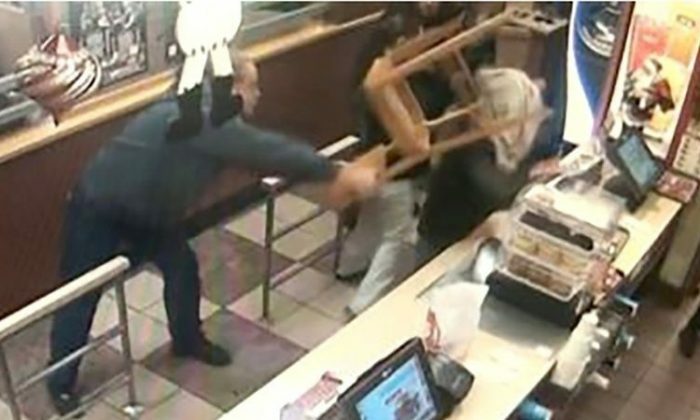 A Wendy’s customer used a chair to thwart a would-be robber in Yuba City, California, on Christmas Day. The suspect, who had a knife, threatened the staff at the Wendy’s restaurant while wearing a bag over his head, KTXL reported. “So I kept an eye on him,” said the good Samaritan, who called himself Daniel. “And when I saw the knife I thought, ‘Look at all these people in here. I don’t want this to turn into somebody’s Christmas memorial.’ And yeah, it was about that time, I took a couple steps with that big chair in my hand and brought it down on his head,” he said. “Oh, I hit him on the back of the head. He dropped his head about four inches and held it there for about two seconds. He regained his composure, turned and looked at me and then ran for the door,” he told KCRA-TV. The suspect then ran out of the restaurant and got into a car, described as an early 2000s or late 1990s Honda. “If anybody out there knows a friend who got a gash on the head last night, that was probably the culprit,” Daniel added. “That’s a very traumatic experience, and he helped us instead of standing back and watching it,” said cashier Erika Farris about the incident. The suspect has not been identified. Those with information are urged to contact the Yuba City Police Department.